Jo Jo Reyes is out. Brad Mills is in, at least for today. 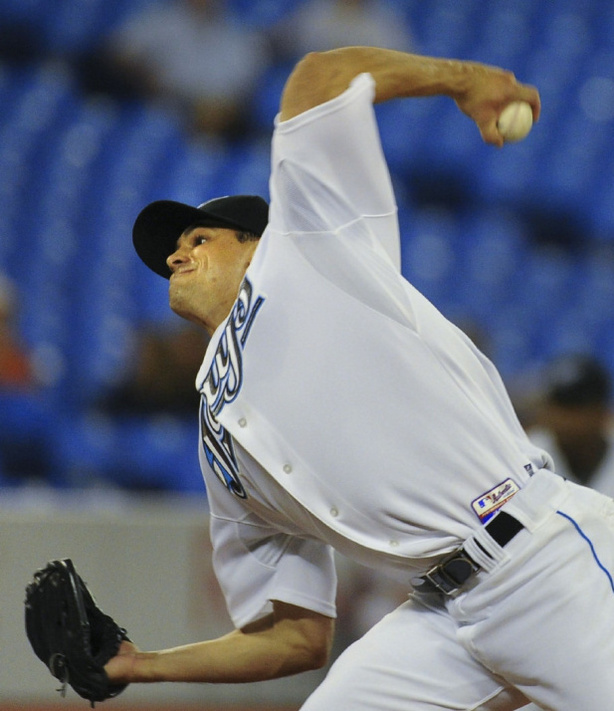 Jesse Litsch, also called up, will work out of the bullpen, in the wake of the departure of Mark Rzepcynski, Jason Frasor and Octavio Dotel. Welcome Colby Rasmus. Hopefully, he and Travis Snider will push each other to meet their ubiquitously spoken of potential. As of Wednesday July 27, GM Alex Anthopolous, video seen at Getting Blanked, had only stated that Brad Mills was called up for temporary bullpen depth, until the Blue Jays new pitchers (P.J. Walters and Trevor Miller) arrived. A decision had not yet been made on who would start Saturday’s game. How quickly things change in these starting rotation sweepstakes. Brad Mills is our #5. Whatever the case may be, Mills deserves at least a 10 game stint in some major league ball club’s starting rotation. He’s dominated in Triple-A, unlike Brett Cecil, Jesse Litsch and Kyle Drabek. He’s got a lot to prove at the big league level, and I think he’s about ready to do it. Zach Stewart is out, no longer part of the puzzle. Our depth of starting rotation makes losing Zach a moot point, (in the modern sense of the term). I don’t think Luis Perez has earned his shot in the rotation, though look for him to rejoin the big club’s bullpen soon. Carlos Villanueva will have to pitch better than he did Thursday over his next three starts, especially if Mills hangs around, Litsch pitches well in long relief and Kyle Drabek continues to bring his ERA back down to Earth. Chad Beck made the jump to Las Vegas this week. Deck McGuire is now a New Hampshire Fisher Cat, and Dustin McGowan is now up to pitching three innings per start with Dunedin. Joel Carreno and Henderson Alvarez are knocking on the Blue Jays door. It will be interesting to see if either gets the chance to show his stuff when the roster expands to 40 come September. The race is always on. The climb is great – the fall is depth.